Desktop Copy 2 Created with Sketch. How smart is your funding? Where does your company stand today? Knowing yourself is crucial before even considering an investment! Where do you want to be in 5 years and how will you get there? Your funding strategy is intertwined with your growth strategy! What are your plans and expectations about your next funding round? Check if they are compatible with your growth and funding strategies as well as current situation! Investors generally prefer startups with growth potential, also international, and a scalable business model. Investors generally prefer startups that have a superior value proposition that they can protect from competitors, and that can obtain an attractive position in their value chain. Investors generally prefer startups that have credible yet attractive financial outlooks and exit potential. Investors generally prefer startups that have a clear target market that is large and growing. Investors generally prefer startups that solve painful problems for the customer, have a clear & compelling value proposition and can demonstrate a market demand. Investors generally prefer teams with ambition that have a solid go-to-market/ growth strategy, and that are able to identify & manage risks. Investors generally prefer teams with committed entrepreneurs that have relevant domain knowledge & track records, as well as complementary expertises. What investment amount are you looking for (in €)? When do you want or need an investment? Please indicate month/ quarter and year. It’s okay if you’re not actively fundraising at this moment. We want to get you in touch with investors so once you will be fundraising you can hit the ground running. In that case, please estimate when you’ll be fundraising. What are your market and technology ‘tags’? Who does your business model primarily target? What is your revenue status? Your run-rate is your revenue per year if you extrapolate this month’s revenue. So: revenue this (or last) month * 12. If applicable, could you explain a bit about the quality of your revenue, e.g. if it is recurring or comes from different customers? Investors love recurring revenue because it’s predictable. In this case, with recurring we mean that you have customers that have a subscription on your product and pay you each week/ month/ year/ etc. Also, revenue that comes from multiple customers is preferred for risk reduction reasons. Does your startup already have other investors on board? If yes, please explain who and what share of the company other investors own. Convince us why your startup will be successful with metrics, social proof and investment commitment. What metrics do you track to measure your startup’s progress? Please mention 1-5 key metrics + relevant quantification. E.g. webtraffic (unique visitors): 20k last month. Do you have social proof? Do you have investment commitment already? E.g. commitment from a regional investment organisation or angel that don’t want to be lead investors. What other ‘proof’ do you have that your startup will be successful? Tell us more about your startup’s plans and ambitions. These answers will help us to see if you are really investor ready. 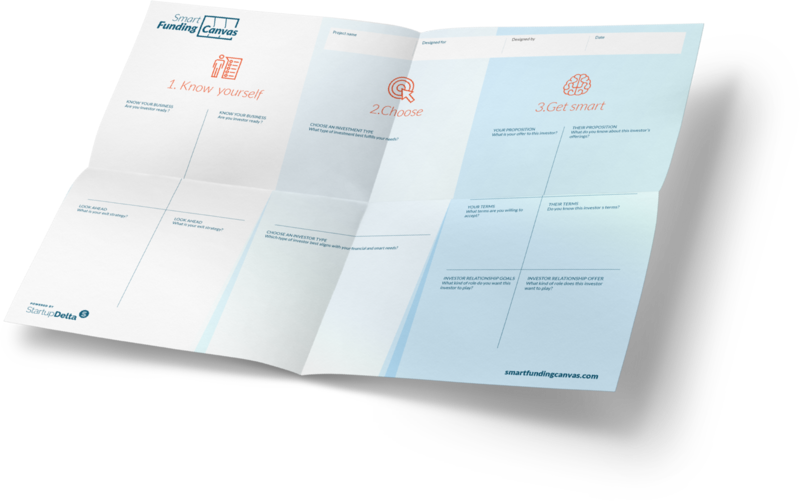 You can use the input of the Investor Readiness Canvas (see elsewhere on this website) for this building block. Team – Investors generally prefer teams with committed entrepreneurs that have relevant domain knowledge & track records, as well as complementary expertises. Execution – Investors generally prefer teams with ambition that have a solid go-to-market/ growth strategy, and that are able to identify & manage risks. Growth – Investors generally prefer startups with growth potential, also international, and a scalable business model. Market opportunity – Investors generally prefer startups that have a clear target market that is large and growing. Value proposition – Investors generally prefer startups that solve painful problems for the customer, have a clear & compelling value proposition and can demonstrate a market demand. Competitive edge – Investors generally prefer startups that have a superior value proposition that they can protect from competitors, and that can obtain an attractive position in their value chain. Investment opportunity – Investors generally prefer startups that have credible yet attractive financial outlooks and exit potential. Curious about how you score on potential, feasibility and investor readiness? You can request an account at Golden Egg Check to do your own assessment and see which investors are most relevant to your company (€125 excl. VAT). Traction is proof that somebody wants your product. Ideally, it should communicate momentum in market adoption. Of course, traction depends on the type of startup and the context of it. Find your way to measure and communicate traction. How do you define ‘traction’ for a start-up? How Do You Get Early Traction For Your Startup? What traction do I need to raise money? Who are current investors in your company, if any? You can mention them by (company) name and by type of deal (e.g. seed capital, (convertible) loan, angel investor). This can also give you some ‘social proof’ to new investors. A cap table shows who current shareholders are and what percentage of the company they own. This is relevant information to new investors, for example to see that founders still have a significant enough amount of shares to keep being motivated and to understand what other investors have a say in the direction of the company. You can summarize the key financial agreements that you made in the past, as this helps new investors to understand the ‘financial legacy’. As a founder, your job is to keep everyone else happy by giving away your company. Give it away carefully, but give it away, because not doing so guarantees you will be the majority shareholder in a worthless enterprise. Consider startup financing stages to identify your company’s current stage, your current investment requirement and your future plan. What are foreseen milestones (i.e. significant steps of risk-reduction and value creation) in your growth plan? Can you split up your total investment need into milestones for your growth? In control or ‘outta control’? How will you get to problem-solution fit and product-market fit? What is your (initial) target market? How will you capture the market? Will you focus on growth or on profit? What’s your plan to scale-up, also internationally? What is your projected growth rate? What is your business model, e.g. are you cheaper or better than incumbents? What are foreseen milestones (i.e. significant steps of risk-reduction and value creation) in your growth plan? What is your exit strategy, if any? How do you see the future of your company? Do you plan on an exit (i.e. sell your shares) or do you want to create a sustainable, profitable business. Acquisition: Selling your company to another company. Initial Public Offering (IPO): Offering your company’s stock to the public stock market. Partly adopted from Exit Strategies for Your Business by Stever Robbins. How to Build a Startup That Gets Acquired by Steven Blank. Of course you cannot predict the future; but you should have a clear idea, based on your business plan, how much money you will need to finance your growth. Investors will want to know about your burn-rate and your breakeven point, so be prepared. Be realistic but ambitious: if you ask too little now, you might slack behind the competition. But then again, there is no such thing as free money. How much money do you need and for what exactly? For instance: We need €50,000 for building a prototype, we need €200,000 for starting mass production of our product, or we need €1.000.000 to strengthen our sales team and scale internationally. Choose the funding need in such a way that it will allow you to achieve a new value creation milestone. You should consider the balance between not raising too much, as the capital is probably more expensive when you’re still is a risky phase, and not raising too little, as you’ll be spending more time fundraising than running the company. In general, we advise startups to raise enough to cover 18 months of runway. Use sales projections to determine your exact funding need. Compatibility is actually a very important thing to consider. It’s about how all section in this Startup Funding Canvas are connected and if that makes sense. It’s important to realize that you can’t have it all. You can’t optimize for the long-term if you don’t consider the short-term. The interests of the founders are not always perfectly aligned with the interests of investor. How will you manage that? What are potential ‘areas of conflict’? How much is your company worth? If you’re raising an equity investment, this is a relevant question. You need to know how much ownership you are willing to give to investors in return for their investment. Be careful not to give away too much equity at an early stage of your business as this could limit your potential for raising future investments and could hinder your further growth. VCs generally love to see that the founders still have a significant stake in the company. Do you know this investor’s typical terms? Have you considered the concepts underlying a term sheet they could offer? Have you researched how they carry out their due diligence and how long that process usually takes? Take initiative in the process of drafting the term sheet; it could improve the deal you get! Have you checked for killer terms? Are you taking on too much risk for your company? Depending on the type of company you have, as well as the growth and funding strategy, some investment types are more relevant than other. Our advice? No venture capital is an option. No value creation for your customers is never an option. Here’s a primer on types of startup funding. Based on your investment needs and preferred investment type, which investor type(s) would suit you best? Consider the basic concepts of startup financing and the pros and cons of the various funding options that suit you, before making a shortlist of potential investors. Remember, you don’t have to just choose one investment type: Combinations are also possible and you can be strategic about such combinations. For instance, choosing an angel investor who has links to a potential client for your business; the angel takes up equity in return for an investment, but he/she also brings in a launching customer, market awareness and revenue. An investor can provide you with more than just cash. Often they have experience as an entrepreneur themselves, have some valuable contacts or have links to talent that can help you expand your business. Using insight from the questions you asked yourself in the previous blocks, you can determine which aspects of building your business you could use some help with. A public investor might be able to help you come in contact with governments: if your business is focused on the public sector or if your product isn’t lawfully approved yet. A corporate partner or a university could, for example, help you develop your product further by leveraging their high-tech facilities and knowledge. Just the way you did with your terms, think about your ideal investor and their ideal deal offer: What do they typically offer and ask for in return? Do the terms of that sort fit with the ones you’d like to offer? Think about ways to improve the alignment between your terms and your investor’s terms. Do not hesitate to be critical: It is fine to say no and explore other options if the terms of the deal don’t feel right. Consider your smart needs and ownership preference: Do you want something more than money from your investor? What kind of role do you want this investor to play? For instance, maybe you want an investor who has access to the US market, or maybe you want an investor who can attract solid technical talent to your team. Do they want to advise, be actively involved or just want to be passive? Does your potential investor have a focus on your business’s sector? Based on your current weaknesses and future plans, what expertise or contribution (beyond money) do you need from your investor? What are areas in building your business that you could use help with? Does the investor offer sufficient added value (beyond capital) for building, supporting and/or scaling your business model? Have you checked the investor’s track record concerning the extra value they offer? Have you checked how many successful exits they’ve been able to orchestrate? It can be a good idea to talk to some companies in your investor’s portfolio; they can give a good impression of your investor’s track record in creating value and incentives for the portfolio companies. 1. What kind of role does this investor want to play in your company? Do they want to advise, be actively involved or just want to be passive? 2. Does the investor offer sufficient added value (beyond capital) for building, supporting and/or scaling your business model? 3. Have you checked the investor’s track record concerning the extra value they offer? Have you checked how many successful exits they’ve been able to orchestrate? a. It can be a good idea to talk to some companies in your investor’s portfolio; they can give a good impression of your investor’s track record in creating value and incentives for the portfolio companies. Funding Strategies - Should you even raise money? What Are The Startup Funding Rounds? What % of My Company Should Investors Get? Submit resources and tell us what they think of the user experience and the canvas. StartupDelta and Golden Egg Check jointly created the Startup Funding Canvas to help entrepreneurs to think-through their funding strategy. This canvas – and related content – can be used free of charge by startups, incubators, accelerators, business advisors, investors etc. For every block in the canvas, there is a short introduction about the topic and a list of questions you should be able to answer to know if you are ready to proceed further. For every block, we also give you tips, tricks and links to other sites that provide tools or interesting content on the subject at hand. After every deep dive into external content, you can return to the canvas and proceed to the next block. think about and construct a funding strategy. make a choice about what kind of investor(s) you need to talk to. get ready for meetings with investors. get a practical understanding of your financial needs and how to meet them. have a feedback loop to keep improving your funding strategy. Bear in mind though: this canvas is not going to guide you to one right answer, since a funding strategy is quite personal. But it will help you in asking yourself the right questions and becoming more knowledgeable about the subject of startup funding.